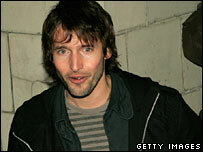 Singer-songwriter James Blunt helped the British music industry to one of its best-ever year for sales in 2005. A record 126.2 million artist albums were sold last year, with Blunt's Back To Bedlam topping the chart, according to the British Phonographic Industry. Single sales were up by almost half to 47.9m, with the growth coming from the rapid growth in internet downloads. The BPI said the final week of 2005 saw download sales top one million for the first time. Tony Christie's revived (Is This The Way To) Amarillo was the top-selling single track of 2005. Album sales also hit a weekly record in the week before Christmas, with 10.4 million albums being sold, a 40% increase on the same week in 2004. Other top-selling albums included Coldplay's X&Y, Intensive Care by Robbie Williams and Employment by Kaiser Chiefs. But compilation album sales are down by 15.7%, which the BPI is putting down to consumers making their own compilations by using download services. It also blames piracy, with sales of illegal compilations at markets and boot fairs believed to be rising. This meant that overall album sales were down by 2.7%, despite the 1.4% rise in artist album sales. BPI chairman Peter Jamieson said: "A rich crop of albums from both debut and established acts meant that 2005 will be remembered as yet another great year for British music, and helped us record the best year ever for artist album sales."